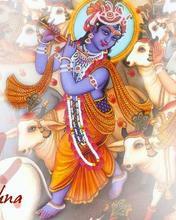 The next morning in Gokul, the word spread that Nanda had a little boy and he was named Krishna. Now kansa knew that his would be slayer was still alive and was in Gokul, so he summoned a wicked demoness name Putana. He ordered Putana to go to Gokul and kill every baby born in the month of Shravan. Now Putana using her magic turned into a beautiful woman, she then applied poison on her breasts. In Gokul she then searched for all the babies of the right age. She would act as if she was playing with them and then she would nurse them with her poisoned breasts. In this way, she killed many babies. Finally she came to Nanda's house and found baby Krishna there. She acted as if she was playing with the child, and then she picked him up and started to feed him. Now baby Krishna being divine, instead of succumbing to her evil ways, sucked the life out of her. Krishna grew up a playful, mischievous child. He grew up amongst the cowherds of Gokul and even came in contact with his brother Balrama. 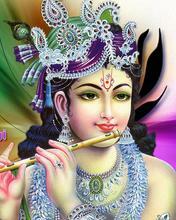 Another miracle Krishna performed as a teenager was the taming of Kaliya. Kaliya was a poisonous snake with many heads, and inhabited a lake in Gokul. Kaliya would devour any cow that would drink from the lake. Krishna, angered by this, took a vow to tame Kaliya. He jumped into the lake and fought Kaliya. Alarmed by this, his friends ran to the village and informed his parents. Upon returning to the lake they found pools of blood on the surface of the lake. They though that surely Krishna was dead. After a while, the many headed Kaliya rose to the surface with Krishna dancing on top of him. Kaliya was tamed. Krishna then ordered Kaliya to leave the lake and the inhabitants of Gokul alone. The people of Gokul used to worship Indra, the arrogant King of the devas, more out of fear than of love of him. Krishna thought that this was wrong. He said that they should instead worship the Mountain Govardhana (Gokul was on the foothills of this mountain) who had given them so much. The people started to worship Govardhana, this made Indra really angry. Indra, in order to punish them for their insolence, sent storms their way. It rained for many days and Gokul was flooded. The people of Gokul approached Krishna for help. 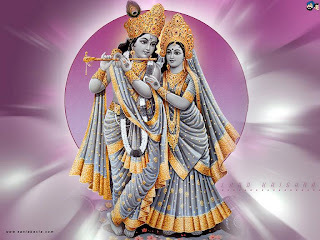 Krishna lifted the entire mountain Govardhana with his little finger and gave shelter to the people of Gokul under it.